Plaque-building bacteria has been the bane of proper oral health since the dawn of time. While there are a number of individual risk factors related to the occurrence of cavities and periodontal diseases, plaque prevention is the most highly effective way to keep these ails at bay. Mechanical measures such as toothbrushes, floss, and toothpicks are highly popular and effective, as long as they are being carried out correctly and regularly. Chemical measures can act as supplemental hygiene aids; one of the most widely accepted example is chlorhexidine as found in mouthwashes. While incredibly effective, chlorhexidine also totes several unfortunate side effects. Therefore, antibacterial herbal alternatives are being sought that are both safe and effective for promoting oral health. 60 participants between the ages of 20 - 25 were chosen for this study; it was required that they had received no dental treatment or oral drug therapy in the last three months. Before the study, each participant underwent scaling and polishing in order to equalize the playing field. Then, they were randomly divided into two groups. 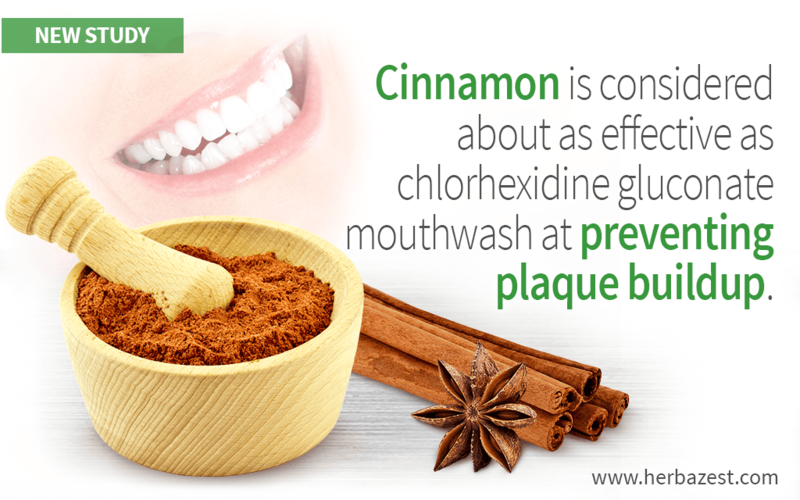 One group received chlorhexidine gluconate mouthwash and the other an herbal mouthwash composed of 50% yellow myrobalan (Terminalia chebula) and 50% cinnamon extract. Both were instructed to rinse with 10 mL of mouthwash twice per day - after breakfast and after lunch - for three days, and refrain from rinsing with water afterwards. Data from before and after this exercise was collected and analyzed. Neither group showed any adverse reactions to the mouthwashes after three days of regular use. Both groups showed significant decrease of the presence of plaque, and while the chlorhexidine group showed slightly greater decrease, the difference between the two groups was negligible. Both mouthwashes were thus considered to be highly effective for preventing plaque buildup. Due to the unfortunate side effects of the highly efficacious chemical chlorhexidine, as well as the increasing demand for alternative products, more research needs to be done on herbal alternatives for oral health. Both T. chebula - sometimes referred to as the "King of Medicines" in Tibet – and cinnamon are known for their antifungal and antibacterial properties, and have been used in the natural management of oral health in traditional medicine. This study shows encouraging promise that effective, affordable, and risk-free alternatives for oral hygiene are available in the natural world. Pharmacognosy Research, Are herbal mouthwash efficacious over chlorhexidine on the dental plaque?